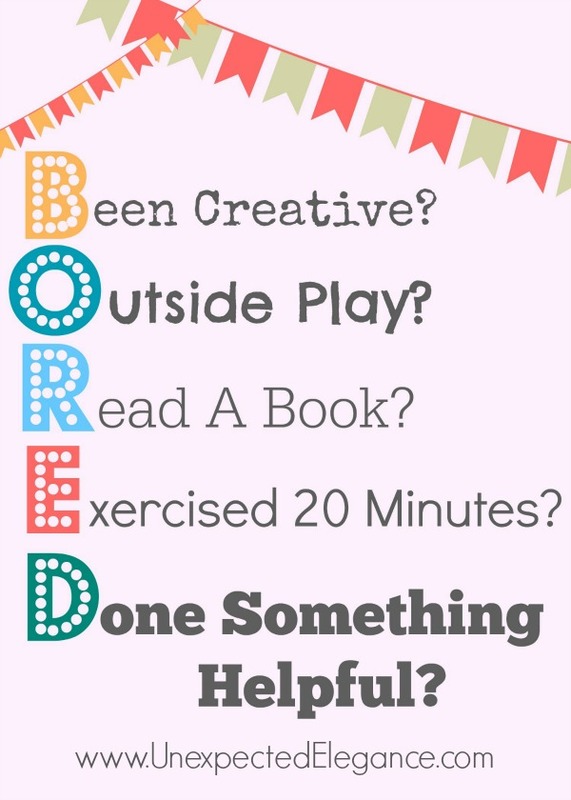 Last week a friend posted a picture on Facebook with the word BORED as an acronym. I though it was such a GREAT idea to use with my girls!! During the school week I seldom hear the word bored, but with summer coming up I have a feeling I might need this more often! Here’s the original post from Grateful for the Ride. Each letter in the word asks a question. Have you BEEN CREATIVE? Did you color, work on a craft project or make a loom bracelet? Have you READ A BOOK today? For younger kids this could be a picture book. Have you EXERCISED FOR 20 MINUTES? This can be any kind of physical activity: riding their bike, playing soccer,or even Just Dance on the WII. Just something that has gotten their heart pumping! Have you DONE SOMETHING HELPFUL? Being helpful can mean a lot of different things! It can be something as simple as helping their sibling tie their shoes or get dressed. The girls have been on Spring Break and it has been a great tool to keep them from always telling me how “BOOORRED” they were. To get a BORED Free Printable click on the either size below to download!! These are gorgeous. So helpful. I’m happy to have them hanging in my children’s rooms, and I really appreciate them.